This post is coming a bit late to the game but a few months ago I wrote a post mentioning Tracy Morgan’s traumatic brain injury and I can’t help but follow up now. Last week Tracy returned to the stage as a presenter at the Emmy’s and was received with a standing ovation by all. It was beautiful and his speech seemed honest and thoughtful and sprinkled with just enough jokes to keep me from getting weepy. If you haven’t seen it yet, please check it out. It’s so exciting to see survivors returning to their life, or stealing a few minutes with friends to remember the good things they have to live for. But even more exciting to me was to see all those colleagues excited for Tracy and honouring his journey over the last 15 months. Imagine how much good we could do for TBI survivors if we started greeting them with cheers and friendship instead of frustration that they aren’t further in their recovery faster? Imagine how we could affect our loved ones if we honoured each step they take as a triumph? It was a beautiful moment for me and a good reminder to be supportive of my husband and friends as they navigate their new normals. I never know if I notice more research and stories about traumatic brain injury because we’re in that club now or if our news at large is featuring more stories about brain injury. It seems I can’t go a day without a new article or name showing up on my Facebook feed. And while I am sorry to see anyone join these ranks I can’t help but hope with some of the famous names starting to talk about their injuries there might be further advancements made in TBI care. Sharon Stone has been featured in many magazines lately talking about life after a brain aneurysm. While most of the articles segue easily from pesky brain injury symptoms to her wealth and movie projects I’m still hoping that her openness gets people talking. If someone with vast amounts of wealth and connections is still suffering more than a decade later why are we judging individuals that can’t return to work within a year? Tracy Morgan‘s brain injury from a car crash in June 2014 has brought to light the struggles doctor’s have with suggesting time limits on recovery and how much WORK survivors need to do to get their life back . As a well loved comedian with mass appeal I think there are a lot of people watching to see how he recovers and hopefully this will start conversations about brain injuries. These two cases are in addition to all the NFL and NHL players that have been open about their issues with concussions, post concussion syndrome and traumatic brain injury. I wrote about my love for Amy Zellmer’s Huffington Post articles in this blog entry in July. I am so grateful for her articles for inspiring us on hard days and making TBI life more accessible and understandable to our friends and family. Now she has a kickstarter campaign to fund her book which will include her Huffington Post articles. There are quite a few pledge levels so don’t feel like you need to be rich to help this woman meet her goals. Even $10.00 gets you a copy of the book. Personally I can’t wait to get our copy and to be able to share with everyone we know. I’ve seen two different ad campaigns to raise awareness for TBI lately and I wanted to write a bit about them on our blog. Both of these campaigns are focusing on the traumatic brain injuries caused by not wearing helmets. Often over the last few months my friends with experience with TBI and I have talked about how we cringe inwardly when we see kids riding their bikes without helmets. Studies show that helmets reduce between 69-85% of traumatic brain injuries in cyclists. While helmets don’t protect individuals from everything (just look at the NFL) I do think this is a demographic worth targeting. The first is a series of photos showing people after their TBI. I have yet to track down it’s origins but the powers of Pinterest and Facebook have had these in my face almost every day for the last couple of weeks. I find these ads absolutely heartbreaking – which is probably the point. I don’t know if they would benefit the young adult group that often suffers from TBI in Canada because that 18-40 year old crowd still thinks they won’t be the one to end up with an injury. I do think this campaign would strike a cord with family members or friends that might encourage their loved one to start using a helmet during their activities more often. The second campaign is far more entertaining and seems to be getting a lot of support from that 18-40 year old group. The Naked Challenge features equestrian riders (and now at least one snowboarder) naked except for some strategically placed helmets and the caption “I would rather go naked than not wear a helmet”. It’s catchy and fun and the name alone attracts curious people to their page. 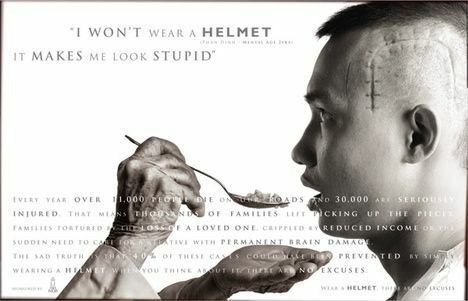 I think it’s a great sentiment and will hopefully get people talking about the consequences of not wearing helmets. Please check them out and give their page a like!